Next to the fall of man, the worship of the golden calf is, in rabbinical theology, regarded as the sin fraught with the direst consequences to the people of Israel. "There is not a misfortune that Israel has suffered which is not partly a retribution for the sinof the calf" (Sanh. 102a). The very seriousness of the offense leads the Rabbis to find circumstances extenuating the guilt of the people, and to apologize for Aaron's part in the disgraceful affair. The initiative was taken not by the Israelites, but by the Egyptians who had joined them at the time of the Exodus (Ex. xii. 38), and who were the source of a great deal of trouble to Moses and the Israelites (Num. xi. 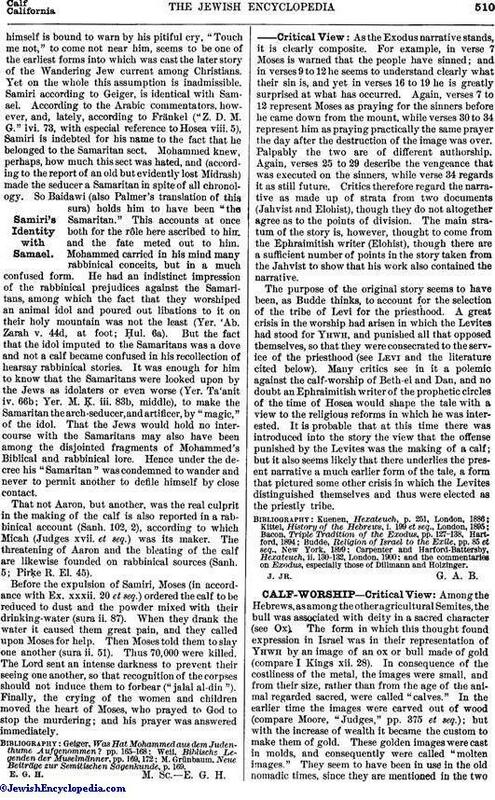 4); for the Egyptians, when the time fixed for Moses' descent from the mountain had expired, came in a body—forty thousand of them, accompanied by two Egyptian magicians, Yanos and Yambros, the same who imitated Moses in producing the signs and the plagues in Egypt—to Aaron, and told him that it was the sixth hour of the fortieth day since Moses left, the hour he named for his return (a play upon the word , Ex. xxxii. 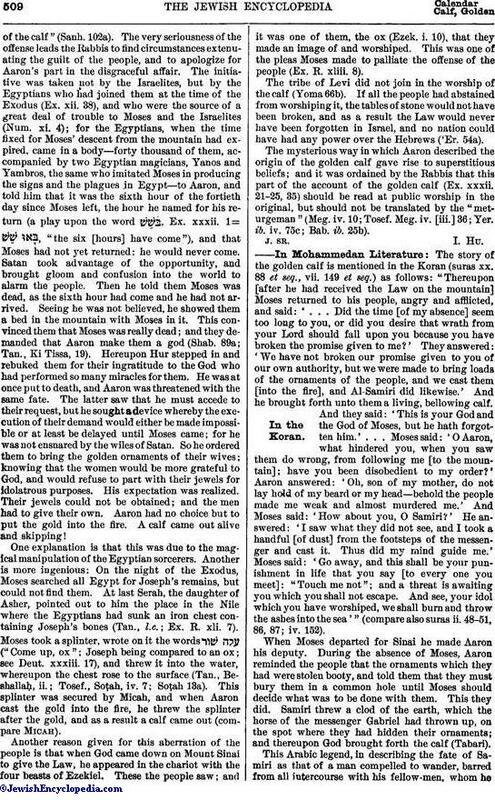 1= , "the six [hours] have come"), and that Moses had not yet returned: he would never come. Satan took advantage of the opportunity, and brought gloom and confusion into the world to alarm the people. Then he told them Moses was dead, as the sixth hour had come and he had not arrived. Seeing he was not believed, he showed them a bed in the mountain with Moses in it. This convinced them that Moses was really dead; and they demanded that Aaron make them a god (Shab. 89a; Tan., Ki Tissa, 19). Hereupon Hur stepped in and rebuked them for their ingratitude to the God who had performed so many miracles for them. He was at once put to death, and Aaron was threatened with the same fate. The latter saw that he must accede to their request, but he sought a device whereby the execution of their demand would either be made impossible or at least be delayed until Moses came; for he was not ensnared by the wiles of Satan. So he ordered them to bring the golden ornaments of their wives; knowing that the women would be more grateful to God, and would refuse to part with their jewels for idolatrous purposes. His expectation was realized. Their jewels could not be obtained; and the men had to give their own. Aaron had no choice but to put the gold into the fire. A calf came out alive and skipping! One explanation is that this was due to the magical manipulation of the Egyptian sorcerers. Another is more ingenious: On the night of the Exodus, Moses searched all Egypt for Joseph's remains, but could not find them. At last Serah, the daughter of Asher, pointed out to him the place in the Nile where the Egyptians had sunk an iron chest containing Joseph's bones (Tan., l.c. ; Ex. R. xli. 7). 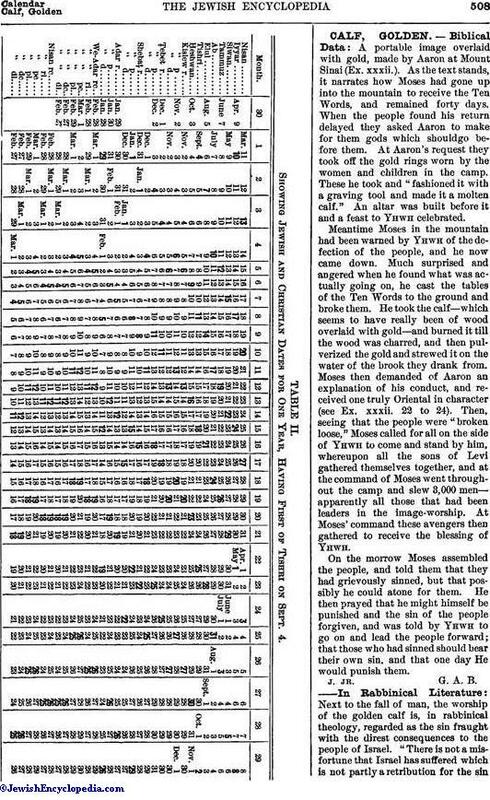 Moses took a splinter, wrote on it the words ("Come up, ox"; Joseph being compared to an ox; see Deut. xxxiii. 17), and threw it into the water, whereupon the chest rose to the surface (Tan., Beshallaḥ, ii. ; Tosef., Soṭah, iv. 7; Soṭah 13a). This splinter was secured by Micah, and when Aaron cast the gold into the fire, he threw the splinter after the gold, and as a result a calf came out (compare Micah).